What are Phytonutrients & How do they Help Plants? ‘Phyto’ or plant nutrients are protective compounds produced by plants to minimise damage from UV radiation, insect attack, toxins and pollution. Kind of like an internal security system. Pretty amazing hey? One bonus is that scientific research shows many of these same phytonutrients also benefit us when we eat these fruits and vegetables as a whole food. These compounds work in synergy with each other for optimal health, a bit like how an orchestra makes beautiful music when each musician plays their part at the right time. Many phytonutrients also produce the natural intense pigments of colourful fruits and vegetables. For example, the purple in plums or glossy skinned eggplant and deep blue in blueberries. They are also responsible for the smell and flavours of foods. Fruits and vegetables contain concentrated sources of a huge variety of phytonutrients. So putting colour on your plate and especially purple foods, may help prevent disease and promote healing. 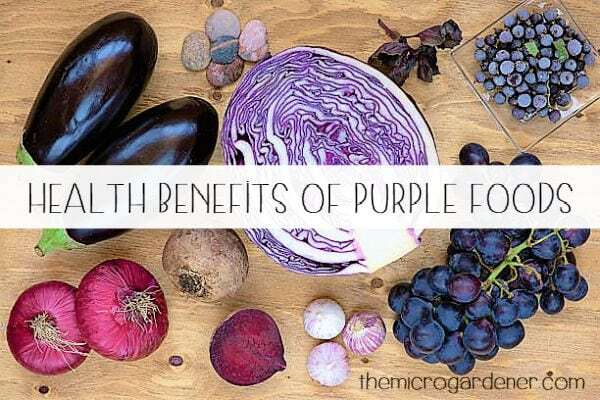 What are the Health Benefits of Purple Foods? I’ve read so many scientific research reports on this topic and learned so much about how healing some of our everyday foods can be. If you like reading that kind of thing, check out the references at the end of the article. Here, I just want to summarise a few of the reasons to eat (and grow) more purple foods. 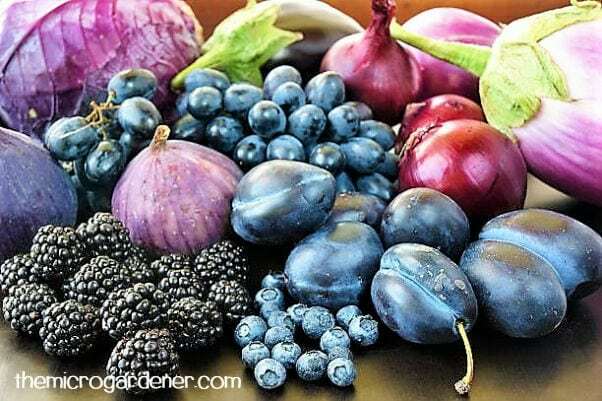 Some of the most valuable pigments in purple foods are known as anthocyanidins which are responsible for the purple-blue colour of fruits like blueberries, raspberries, blackberries and grapes. They are antioxidants which help protect against oxidation and damage to the cells. There are many studies on different types of berries that indicate they can have wide ranging health benefits. Studies indicate anthocyanins may help protect against the risk of cardiovascular disease and stroke by stopping clots from forming. They also may prevent some cancers and diabetes, as well as improve memory. 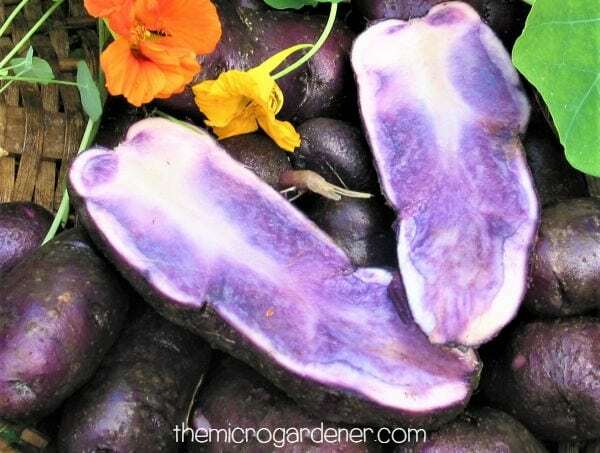 A Japanese study on purple fleshed sweet potatoes found they contain high levels of anthocyanins. These help destroy free radicals which prevent damage in the body, reduce blood pressure, protect the liver and regulate glucose levels. Not bad for a humble spud! Glad I’m growing these tubers as a ground cover in my garden. The purple leaf tips are also edible. Sweet potatoes also make an attractive ground cover with pretty purple blooms that attract bees and improve pollination. They also grow well in deep pots. So, one of the roles that purple pigments play is to help protect against damage in the body that can lead to disease. Purple foods also contain Flavonoids (flavonols) including Resveratrol with anti-inflammatory properties. 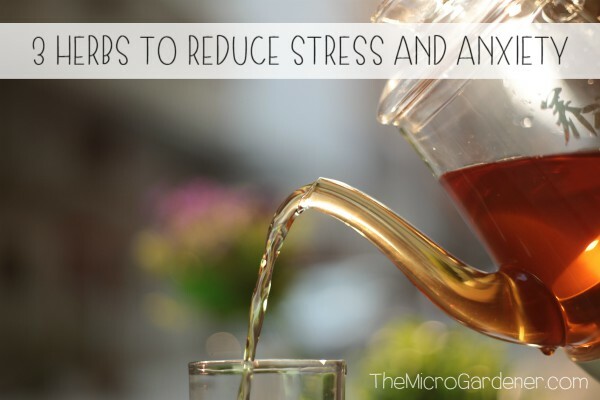 This compound may also help combat many diseases, decrease blood pressure and promote healing. Numerous studies have shown Resveratrol has anti-cancer effects by helping inhibit growth of cancer cells and directly causing cell death. Exciting stuff! Studies showed some foods have very high levels of this valuable phytonutrient. e.g. Concord purple grapes, red wine (yay!) and berries – especially mulberries. 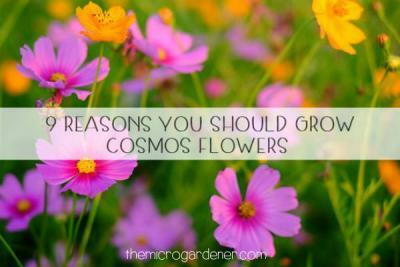 Compelling reasons to eat and grow these foods. Feeling excited? How can you get more Purple Foods in your Diet? There are a wide variety of fruits high in these phytonutrients. These include many berries. For example, blackberries, mulberries and blueberries. Also, vegetables with purple skins and flesh. These include purple sweet potato, eggplant, red cabbage, beetroot and purple potatoes. Likewise, figs, purple olives, red onions and even lettuces with purple/red leaves also contain these nutrients. But there are LOTS more! 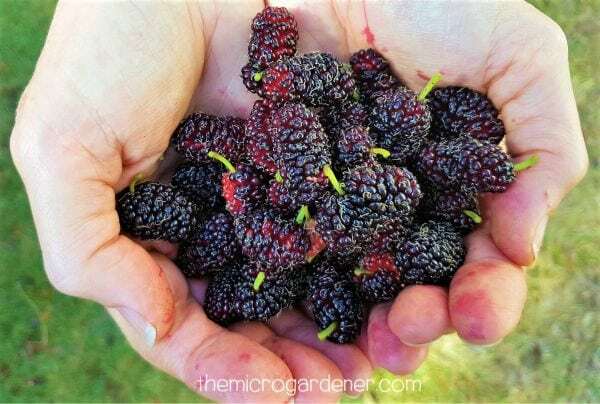 For example, black/purple mulberries are easy to grow in a pot or your garden. I grew both my small trees from cuttings. Within one year, they were fruiting and I get 5-6 harvests/year, allowing me to freeze bags of berries as well as enjoy them fresh. You can do the same even if you have a small space. So don’t think you have to spend a fortune on buying fruits and vegetables. There’s a huge number of edibles you can start adding to your diet to boost the health benefits. I’ve put together a FREE comprehensive list with 50+ fruits, vegetables and herbs to help you get started as well as 3 delicious easy recipes to try. No excuses! You can also find safe, organic and heirloom seed varieties in this list of seed suppliers. 1. To get more purple vegetables on your plate, start to intentionally choose to grow or buy varieties with purple/dark red/blue colours. 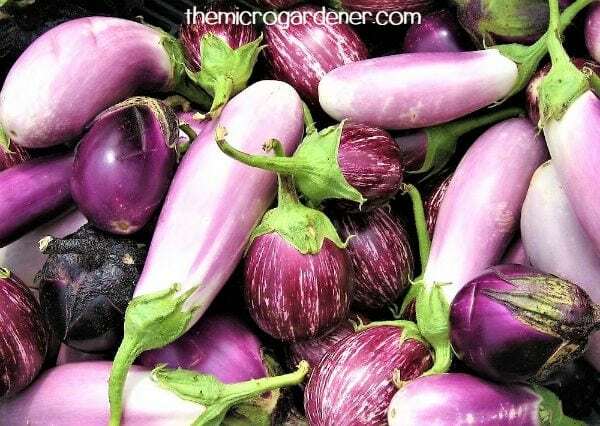 You’ll find 30+ vegetables on my list with specific purple cultivars. If you eat other orange fruits or vegetables, try swapping orange sweet potatoes for purple fleshed ones. Try to mix up the colours you eat. 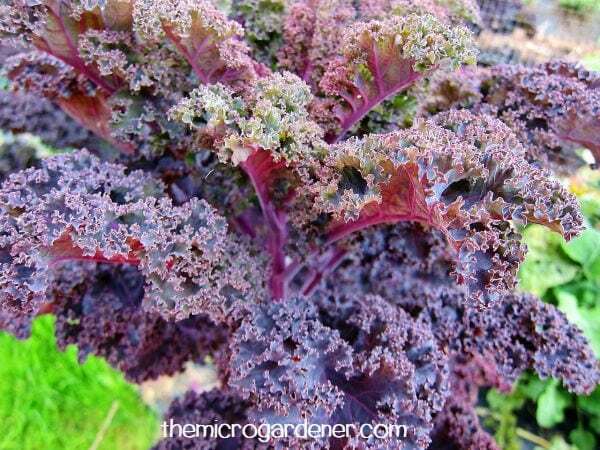 If you love kale, why not get the benefits of eating both green and purple pigments with a purple kale variety? 2. Consciously look for purple vegetable varieties when you shop or visit farmers markets. 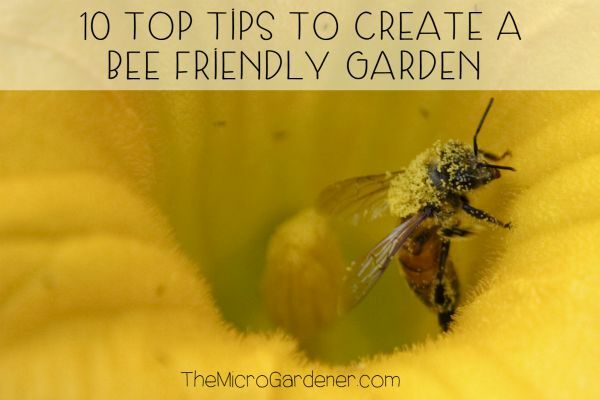 For example, a simple way to eat more red cabbage, purple kale and other leafy vegetables is to buy or grow them as microgreens. You only need a tiny space and can eat the rewards within 1-2 weeks rather than waiting months for a full head of cabbage to grow. Smart hey? 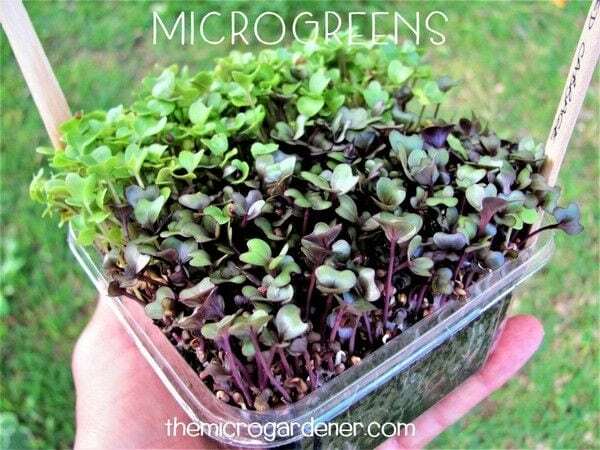 There are lots of vegetables and herbs on my list that you can grow as microgreens. So, check them out to save money, space and time. 3. 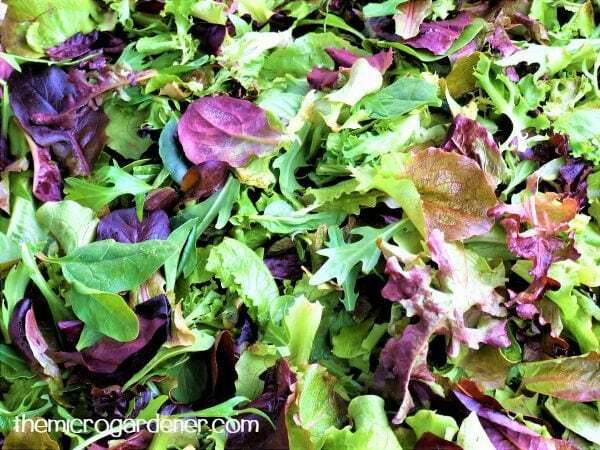 Instead of just your usual greens, add red oakleaf or frilly lettuce varieties in salads. Similarly, get creative with purple kale, basil, endive and Asian green varieties. 1. Leave the skin on your vegetables and fruit where possible. This increases the fibre and nutrient value. I NEVER peel my sweet potatoes or potatoes. Instead, I just wash and scrub the skin well before cooking. All that extra goodness and flavour can benefit your health. Anyway, when you cook vegetables in dishes like curries or casseroles, you never taste the skin! Why not start a new trend in your household with purple sweet potato wedges? 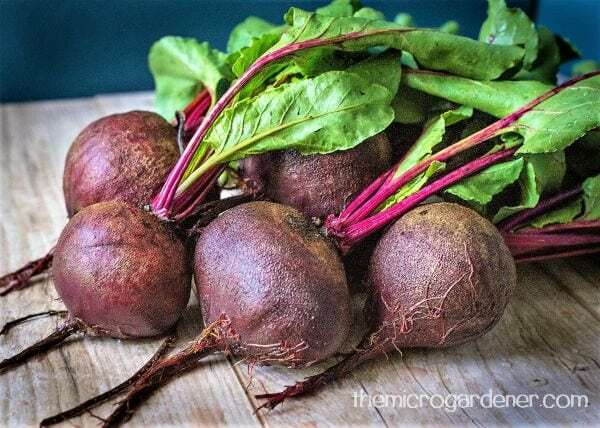 I just lightly scrub beetroot to remove any soil and enjoy the leaves, stems and root parts of the plant. In fact, they are particularly good in fresh juices. 2. Remember, some phytonutrients are heat sensitive and water soluble. So, to maximise their health benefits, try roasting and lightly steaming. This helps retain the purple colour when cooking vegetables with soluble pigments. e.g. Purple King beans, Purple Sweet Potato and Purple Cauliflower. Oh, and that brings me to a little story about cooking with purple vegies. Let me save you from making the same mistake I did! When I first made a soup from my orange coloured pumpkin, purple carrots and purple sweet potato, I didn’t realise the purple colour was soluble, so it leached into the stock during cooking. 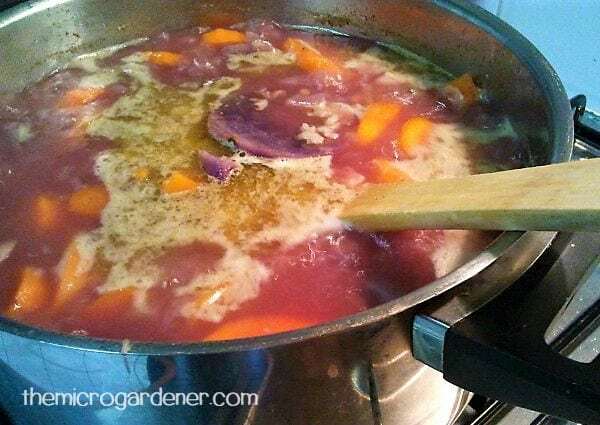 Vegetable soup with purple carrots and sweet potato and orange pumpkin – in PURPLE stock! I should have left it a rustic chunky soup, but I decided to puree it instead. Clearly, I forgot all about what happens when you mix opposite colours together. You know, orange + purple = brown. Mmm … While the soup TASTED great, eating brown soup just isn’t appetizing to look at on the plate! Trust me, I had a LOT of convincing to do to get my family to eat that meal! 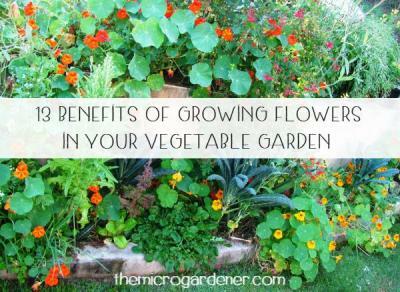 So, if you’re thinking about what to grow in your garden, purple plants offer you a wide variety of health benefits. I hope you’re inspired to try growing and eating a rainbow of fresh ingredients. I eat a whole food plant-based diet, rich in these healing nutrients and am rewarded with great health. 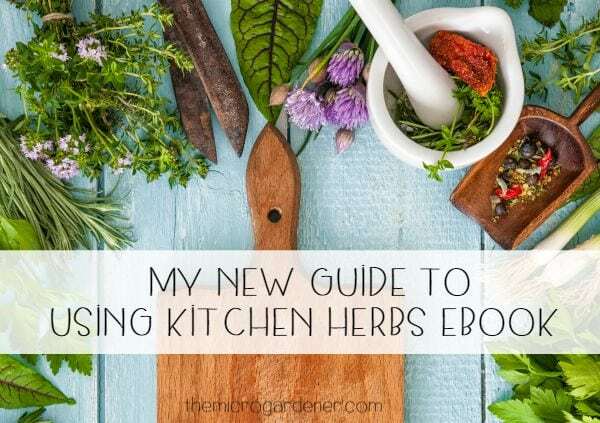 Download my free guide to get started.